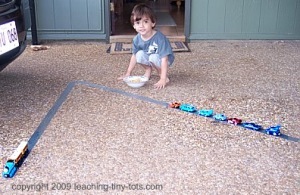 Toddler activities designed with a simple task can be a fun game while also reinforcing basic concepts. 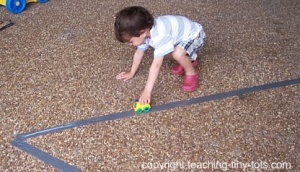 Drive a toy car or truck on the duck tape highway and reinforce following directions, building coordination and developing concentration skills. Make a highway using the Duck Tape. Build it in a shape like a square, triangle or rectangle. Other ideas may include letters with straight lines like A,H, M or V as in the photo. Bring trucks and cars in a basket or container to make carrying easier. Show your child where the beginning is and instruct him or her to "drive" on the highway carefully to the other end. When your child is finished playing, have you him/her assist in putting cars back into container. Learning to put away toys as part of any toddler activity is helpful in reinforcing future good habits. For older toddlers make a maze out of the tape to make it more interesting. Buy two or three different colored Duck tape like Tape Brothers Brand Shorties Colored Duct Tape 2" x 10 yds, Purple and make your highway. Reinforce colors by instructing your child to drive on the red highway or the blue highway etc. Collect milk cartons and cereal boxes and arrange in various places by sticking in place with duck tape to represent buildings. A highway is a main road for travel by the public between cities and states. Highway designs vary widely and can range from a two-lane road to a multi-lane with 5 or 6 lanes. The United States has the largest network of highways. Australia's Highway 1 is the longest national highway in the world and runs almost entirely around the continent.